TAMPA (FOX 13) - If you’re a teacher, your lunch options for Teacher Appreciation Day on May 8 just expanded. In celebration of the annual day, restaurants are offering discounts and free items to educators. Chick-fil-A: School employees can get a free Chick-fil-a sandwich on Tuesday from 11 a.m. to 8 p.m. at participating locations. Chipotle: There are BOGO offers on burritos, bowls, salads and tacos from 3 p.m. to close. Cici’s Pizza: Offering a free buffet if you go to their website and print out a coupon. Culvers: There isn’t a nationwide promotion, and offers vary per location. Check your nearby Culver’s to determine if they will have a special. A valid ID may be required. Grimaldi’s Pizzeria: Participating locations are offering teachers 15 percent off their meals. The chain is also giving away pizza parties for 45 teachers. Through May 11, teachers can be nominated through the contest. Metro Diner: Teachers get 20 percent off their check, from Monday through Friday. 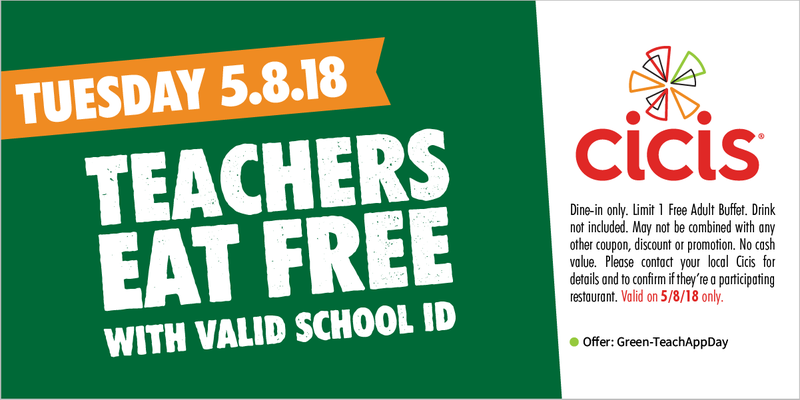 PDQ: There is a 50 percent off deal here too for teachers on Tuesday. Zaxby’s: There is no nationwide promotion, but select locations may have Teacher Appreciation Week specials. Check your local location.